I’m in the middle of writing a story about a haunting that connects Millbank Prison, the occupation of Millbank Tower in the student demonstrations of 2010, and the Tate Britain gallery (which occupies part of the former prison site). I enjoy writing stories based in history. Perhaps my love of the weird and strange in fiction springs from a desire to explore layers of time, mix them up together and see what happens. But historical fiction has its frustrations. Very often I find myself stuck on a detail, then go off on an extended detour searching for information instead of writing the thing. However, such a detail can affect the whole shape or mood of a story. It can even invalidate a meticulously constructed scene. And I’m wrestling with such a detail now… Can any history buffs out there can help me with this? In the early 19th century at Millbank and other prisons, inmates had to wear masks when they left their cells. This was meant to ensure they couldn’t recognise each other, communicate or look in any direction other than straight ahead. Non-verbal communication – nodding, eye contact, looking this way or that – was punished as severely as speaking or passing notes. In the course of my research, several questions came up. What were the masks made of? On the internet I found a replica of a mask worn by prisoners in a Welsh gaol, which was made of a stiff leather. Other accounts refer to the masks as ‘cloth’. 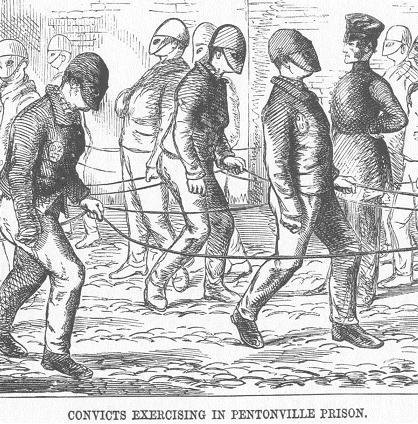 Henry Mayhew’s book on London prisons in the latter 19th century shows Pentonville prisoners at exercise wearing masks that appear similar to the Welsh leather ones. There’s also the matter of gender. Did women prisoners wear such masks? Mayhew has a sketch of a woman prisoner in Wandworth wearing a veil as a mask; apparently this was part of their uniform. I’m also aware that Mayhew conducted his study later in the 19th century, when the use of such masks was declining and soon to be abolished. I can extrapolate, but I’m afraid of getting it wrong. Sarah Waters’ well-known novel, Affinity, takes place in Millbank but again, this in the later 19th century after changes in the regime. If I find out that only men wore the leather or cloth masks, I can deal with it. I can imagine that the prisoner in the story has been subjected to special treatment. Perhaps she didn’t behave in an appropriately feminine manner – which Victorian penal ideology emphasises – and was given a masculine punishment to mark her out and shame her. But I need to know first in order to do this! Also, the construction of the mask does affect the story. What does it feel like on the face? How would people react if you wore it on a demonstration instead of a balaclava or an Anonymous mask? And if it’s a very old mask, leather would be more durable.